This is an edited French to English Google translation of a piece first published at BFMTV. Jean-Luc Mélenchon is a former co president of the ecosocialist Parti de Gauche. Mélenchon is the candidate of France insoumise (unsubmissive France) which is a wide ranging coalition of left and green parties and political groupings in France. Jean-Luc Mélenchon continues to climb in the opinion polls while Marine Le Pen has been declining for several weeks. The latter is now worried by the candidate of the "France insoumise", Jean-Luc Mélenchon. At the Figaro debate this Monday, the president of the National Front made the candidate of "rebellious France" alternately "an immigration champion", a candidate likely to levy "an additional 100 billion euros in tax" or a candidate who "a little, like Philippe Poutou, fucks the French ." The timing of these attacks is not insignificant. Marine Le Pen began attacking her rival, who is polling third in opinion polls, as he started getting closer to her in these polls. Mélenchon can hope to qualify for the final round now, to the detriment of Le Penn, in this month's presidential election. 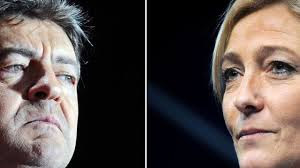 After having siphoned off the support of the candidate nominated by the Socialist Party, Benoît Hamon, can Jean-Luc Mélenchon divert a significant number of voters from Marine Le Pen? "We know that Marine Le Pen usually scores quite high with some young people, though it maybe not be the same young people who have flocked to Mélenchon, but they do compete for this audience. Indeed, according to an Elabe poll for Les Echos, Jean-Luc Mélenchon is the preferred candidate of the 18-24 age group, with 29% of voting intentions in his favour from this audience. Another Elabe poll, delivered last Wednesday, this time for BFMTV, had indicated a tremour in another part of the electorate. It looked at voting intentions by socio-professional category, and observed that Jean-Luc Mélenchon got 18% of white collar voters and 20% among blue collar voters (a three-point increase since the end of March for the latter section of population). Of course, Marine Le Pen remains largely ahead in these sections of the electorate (33% white collar, 39% blue collar) but it is declining. At the end of March, she gathered 45% of the blue collar vote according to an investigation by same institute. "There is competition between Jean-Luc Mélenchon and Marine Le Pen for these voters but it is limited, because for the 'popular electorate,' especially the blue collar workers, the themes of Islam and immigration weigh heavily in this election. Even a limited progression of Jean-Luc Mélenchon in this sector of the population can count though, says Eddy Fougier recalling that "in 2012, Jean-Luc Mélenchon did not score so well amongst the workers." This crescendo in support for the representative of "France insoumise" in the popular classes can be explained in various ways. "Jean-Luc Mélenchon captures a part of the anti-establishment feeling, the desire to try something other than Marine Le Pen's radicality", describes the political scientist who continues: "In a sense, Jean-Luc Mélenchon has two advantages that can appeal both to a category of young people and to a part of the working class world. He has the advantage presented by Emmanuel Macron, that is to say, in short, a humanist logic, and the advantage presented by Marine Le Pen's radicality." Not to mention that these young and active members of the popular classes could be tempted by "the Melenchonian degagism", adds Fougier. "The National Front has said that we should prefer the original to the copy, in terms of the criticism of capitalism and liberal Europe. On these subjects, Jean-Luc Mélenchon is likely to appear as more credible," Fougier says. "When looking at the economic and social situation and what the French say, most say that things will get worse before they get better. In which case, a second round, between Marine Le Pen and Jean-Luc Mélenchon is conceivable. This would be an unprecedented scenario for the radical left to bear the standard of the left (and centre right?) and to go up against the far right for the Presidency," concludes Fougier. The first round of the French Presidential election is on 23 April.